Tesni Evans was taken to five sets in Holland. Tesni Evans will face reigning World Champion Nour El Sherbini as she bids for a place in the semi-finals of the DPD Open in Holland. The 26-year-old admitted she had to dig deep to see off Mariam Metwally to set up the quarter-final clash in Eindhoven. Evans had to battle all the way in a five game battle with the Egyptian before triumphing 11-9, 6-11, 6-11, 11-7, 11-6 in 52 minutes. 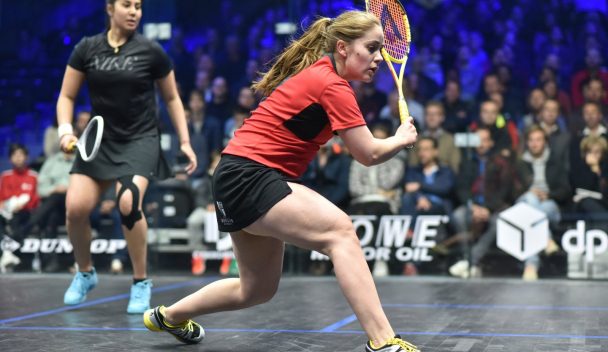 The Rhyl-based World No 9 has also been taken to a decider when she last faced Metwally at the BlackBall Open in Cairo last month. “That was a really big match for me in many ways,” said Evans after her second round victory in the $106,000 tournament. “I’m really happy that I dug in and showed some grit and determination, which I think in the end that is what it came down to. “The last few weeks I haven’t felt myself on court and my main strength is my grit and I didn’t have it. Evans, seeded eight for the event at the DPD Hub, will face the second seed on Friday night. Egypt’s El Sherbini’s came through in straight games against Malaysian icon Nicol David. Joel Makin’s Dutch adventure came to an end but only after he put up a five game battle against No 8 seed Marwan Elshorbagy, who plays for Welsh Wizards. Joel Makin in action in his first round victory in Holland. The 24-year0old, who has risen to 15 in the world, lost 4-11, 11-9, 6-11, 11-8, 8-11 in a gruelling 83-minute battle. “Joel has been playing at a top ten level,” said 25-year-old Marwan, who faces his brother and No 2 seed Mohamed in the quarter-finals. “He has beaten the World No.1, he has beaten a few players inside the top ten so I knew that this match was probably going to be the toughest match I could have got. Tesni Evans fended off a fightback from Hollie Naughton to reach the third round of the El Gouna International in Egypt. The 26-year-old took the first two games 11-9, 11-8 and looked set for a comfortable victory against the unseeded Canadian. Leandro Bacuna insists Cardiff City have what Aston Villa lacked three years ago – the unity to stay in the Premier League. The Bluebirds midfielder – who could replace Aron Gunnarssson against Liverpool today – was part of the Villa squad that crashed out of the top level in 2016. It was a divided dressing room, he says, full of finger-pointing accusations among players against a chaotic backdrop of four different managers in the same season. Mark Williams launched a scathing attack on 'pathetic' World Snooker chiefs after they allegedly denied his son access to his dressing room before his first round victory in Sheffield. The 44-year-old saw off England's Martin Gould 10-7 at the Crucible Theatre to begin his bid for a fourth title. Georgia Davies tried to find some hope in disappointment after she responded to her failure to qualify for the World Championships in South Korea by winning gold in the 50m backstroke at the British Swimming Championships in Glasgow. Davies did not attempt to hide her devastation after she failed to make the selection time in the 100m backstroke on the second night at Tollcross International Swimming Centre.